An in-depth guide to the amps and effect pedals in Stevie Ray Vaughan’s arsenal. Stevie Ray Vaughan’s guitar tone was as dry as a San Antonio summer and as sparkling clean as a Dallas debutante, the product of the natural sound of amps with ample clean headroom. However, Vaughan occasionally used pedals to augment his sound, mainly to boost the signal, although he occasionally employed a rotating speaker cabinet and wah pedals for added textural flair. Vaughan’s fierce playing style was the key to his distinctive sound, but it was also very hard on his equipment, and over the years his amps and pedals were heavily modified to withstand the abuse. Most guitarists with multi-amp rigs will use Fender amps for clean tones and Marshalls for distortion and overdrive, but Vaughan did the opposite. 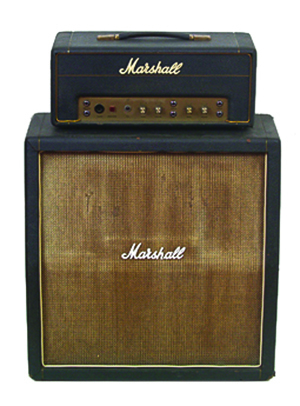 However, it made sense that he used a Marshall for clean tones, as his Marshall was a model 4140 Club and Country combo with two 12-inch speakers, which was Marshall’s version of a Fender Twin Reverb. With 100 watts of output and a power amp section driven by KT77 tubes, the Club and Country provides more clean headroom than the typical Marshall design. The amp remained in Vaughan’s rig until early 1984, when a Dumble Steel String Singer replaced it. The heart and soul of Vaughan’s live rig for most of the Eighties was a pair of Fender Vibroverb combos. The Vibroverbs, each featuring a single 15-inch speaker, were the source of Vaughan’s cranked-up overdrive tones, and he also used one of the combos to power his Fender Vibratone rotating-speaker cabinet throughout his career. 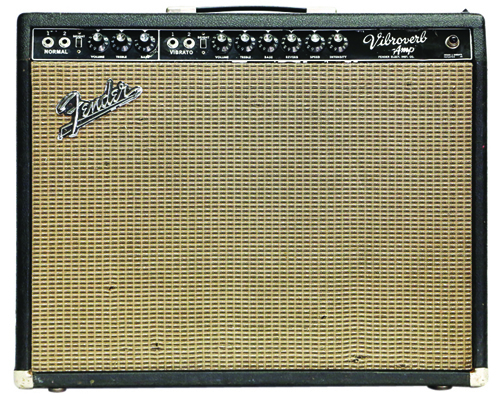 Introduced in 1963, the Vibroverb was Fender’s first amp with built-in reverb. 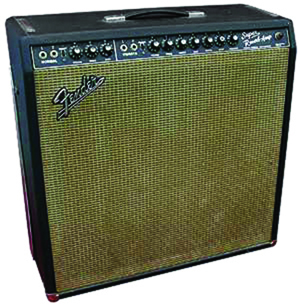 Fender initially produced the Vibroverb with two 10-inch speakers and brown Tolex covering, but in late 1963 the model’s design switched to a single 15-inch speaker and black Tolex. Vaughan always assumed that his Vibroverbs were one serial number apart from one another based on the numbers “5” and “6” on the tube charts, but those are production run numbers and the actual serial numbers were 36 numbers apart. Vaughan first discovered the amps of legendary Los Angeles boutique-amp pioneer Alexander “Howard” Dumble when recording Texas Flood at Jackson Browne’s Downtown Studios in 1982, using Browne’s Dumbleland 300-watt bass amp to record most of the tracks during the sessions. Impressed with the Dumble amp’s ability to maintain crystal-clean tone even when subjected to his aggressive low E string attack, Vaughan custom-ordered a Steel String Singer head, which Dumble beefed up with 6550 tubes and 150 watts of output instead of the model’s usual 6L6 tubes and 100 watts. 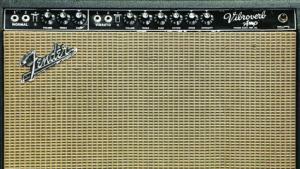 Vaughan usually used his Dumble head with a custom-built 4x12 cabinet loaded with Electro-Voice speakers. When delivered in 1984, the Steel String Singer immediately became the main clean amp in Vaughan’s rig, earning the “King Tone Consoul” nickname that Vaughan bestowed upon it. Vaughan acquired a second Dumble Steel String Singer in 1986. For his 1985 Japan tour, Vaughan used a pair of Fender Twin Reverb amps (a mid-Sixties 85-watt blackface model and a late-Seventies 100-watt silverface version with master volume) in place of his Dumble Steel String Singer head. The Twins disappeared from his rig after that tour, only to resurface for a brief period in 1987 when they temporarily replaced his Vibroverb combos. As Vaughan’s insatiable appetite for power increased, so did the size of his onstage rig, until 1988, when he decided to simplify his multi-amp setup by stripping it down to a pair of high-powered amps: his 150-watt Dumbles and a 200-watt Marshall Major Lead head. Vaughan experimented with a variety of speaker cabinets for the Marshall, including huge 4x15 and 8x10 cabinets designed for bass, before settling on a 4x12 loaded with Electro-Voice speakers like he used with his Dumbles. When recording In Step, his last studio album with Double Trouble, Vaughan had 32 different amps at his disposal, including a 1962 Fender Twin, a mint original 1959 Fender Bassman, and vintage Fender Harvard and Magnatone amps, in addition to the Fender Vibroverbs, Dumble Steel String Singers, and various Fenders and Marshalls he used onstage. When recording each song, Vaughan experimented with different combinations of amps and settings until he dialed in the sound he wanted. 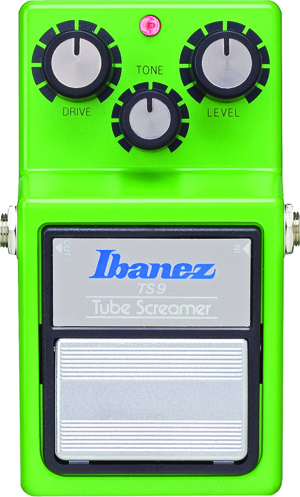 According to pedal-geek lore, Vaughan was a big fan of the TS808 version of the Ibanez Tube Screamer, but evidence in the form of stage photos, live videos, insurance documents and customs declarations reveal that the TS9 version of the Tube Screamer was his preferred choice from 1982 through most of the Eighties. Vaughan usually used his TS9 to provide a clean boost to his Fender Vibroverbs for solos, with the level control all the way up and the drive control set to relatively low gain. In 1988, a new Ibanez TS10 Tube Screamer replaced the TS9 in his pedal board, which Vaughan generally used to generate high-gain distortion (with both the drive and level controls boosted) that wasn’t otherwise available from his Dumble and Marshall Major rig. The lush rotating-speaker effects heard on Vaughan tracks like “Cold Shot” and “Couldn’t Stand the Weather” were generated by a Fender Vibratone speaker cabinet. Similar to a Leslie Model 16, the Fender Vibratone is designed for gigging guitarists and features a rugged, roadworthy cabinet covered in black Tolex. More importantly, the Vibratone is also designed for use with a standard guitar amp and features a guitar speaker that emphasizes crucial midrange tones instead of the full-range, two-way woofer and tweeter speaker array found in most Leslie cabinets. 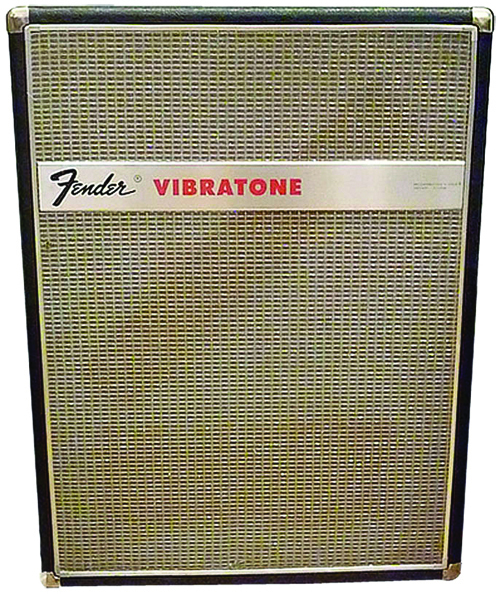 Fender sold the Vibratone from 1967 through 1972, and it is still considered one of the best true rotating speaker effects for guitarists. Although Vaughan didn’t use the Roland Dimension D in his live rig, it was a secret weapon in the studio, where he often added it to his guitar tracks during mixing. Vaughan first discovered the Dimension D while mixing his guitar tracks on David Bowie’s Let’s Dance, and he liked how its subtle chorus effect thickened his guitar sound without changing his natural tone significantly like other chorus effects frequently do. The Dimension D was used on the solos to “Mary Had a Little Lamb” and “Pride and Joy” on Texas Flood and most of the solos on Couldn’t Stand the Weather. During mixing, Vaughan would add the Dimension D effects himself via the effects send/return controls on the mixing console. 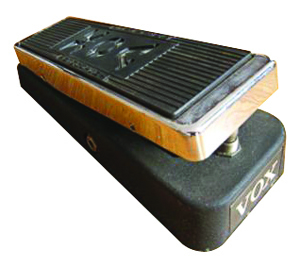 Vaughan’s wah pedal of choice was a Vox V846 from the Sixties that originally belonged to Jimi Hendrix. Jimmie Vaughan, Stevie’s brother, acquired the pedal from Hendrix when Jimmie’s band shared a bill with the Experience in Fort Worth. Vaughan owned several other Vox wah pedals and was allegedly very fond of an early Seventies version with a Japanese TDK inductor. Vaughan tended to prefer clean tones and natural tube-amp overdrive, but in 1988 he added an original Sixties Dallas-Arbiter Fuzz Face pedal to his rig when he became obsessed with emulating Jimi Hendrix’s signature sounds. Unfortunately, the Fuzz Face’s germanium transistors were extremely unreliable when exposed to hot stage lights or the sun during outdoor gigs. Vaughan collected several Fuzz Face pedals, and he would try several during sound check to choose the one he thought sounded best that particular day. Eventually, he got tired of the unreliable transistors in his Fuzz Face pedals, so he had them modified by his amp tech Cesar Diaz, who later used the modifications as the basis for the Diaz Texas Square Face pedal. 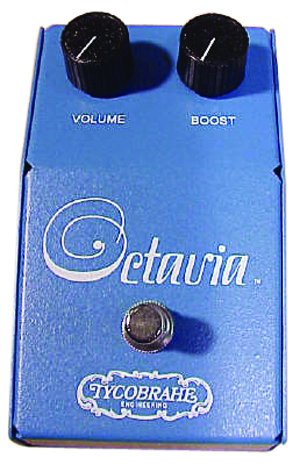 Another key effect that Vaughan used to emulate Hendrix tones was an Octavia fuzz pedal that produces octave-up effects. Vaughan initially used Roger Mayer Octavia pedals (housed in distinctive “spaceship” metal boxes), but when Diaz located three New Old Stock Tycobrahe Octavia pedals, Vaughan switched to those. His guitar tech, Rene Martinez, says that Stevie thought the Tycobrahe pedal produced the best Octavia effect he had ever heard. Vaughan especially liked how the Octavia sounded when used along with a Tube Screamer.